Zombie-Loan is a shounen manga written and illustrated by Peach-Pit (DearS, Rozen Maiden) and published by Square Enix. The series first chapter was published in November 2002 and run until March 2011 and count thirteen volume. Before thinking writing a post on the series, I had the re-read the manga, which was a really good thing. I was introduced to hot looking guy, like Sotetsu, that I forgot about once again. It’s maybe a shounen manga, but there is a lot of eyes candy for the female reader. Zombie-Loan have a generic character setting, two boy who can’t get along and a air-headed girl. It’s not the first time we see this trio in a series and it will not be the last time. Putting aside that fact, we have a interesting story where not all the zombie are bad, where we get a second chance in life. wo guy to find and “kill” illegal zombies after they raise the amount of their debt to save her. Now she doesn’t really have the choice to stick around them even if they are not always nice to her, but thing will gradually start to change. 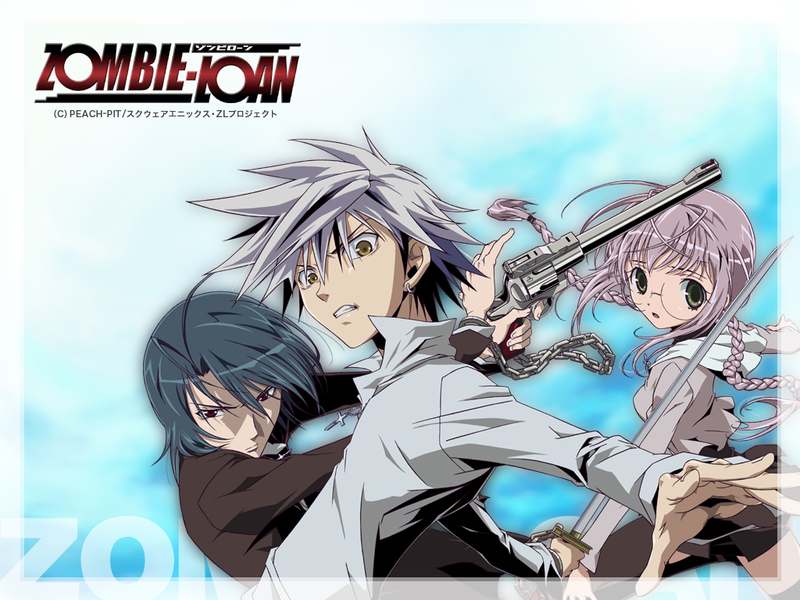 Supporting the main three characters, we meet Bekkou, who is a ferryman and created zombie by signing a contract with death people, Yuuta who is also a zombie, but have the abilities to heal people and Koyomi the descendant of the Yoimachi family and have a double personality, Yomi, who can speak the language of the Death. read. The manga series got his anime adaptation in 2007 by the studio Xebec (Pandora Heart, Love Hina). The anime series count thirteen episodes. I haven’t watch it yet, it’s still sitting in my queue list on Crunchyroll. Have you read or watch the series, let us know what you think of it in the comment below. Previous Previous post: Fanfic Once a Month…Let’s Try It!! Next Next post: First Impression: ACCA: 13-Territory Inspection Dept. I watched the anime many years ago and I plan to rewatch it because I don’t really remember anything from it. Awesome. Will investigate elsewhere because it sounds kind of fun. I said I haven’t watch it, but I heard the manga is better than the anime.